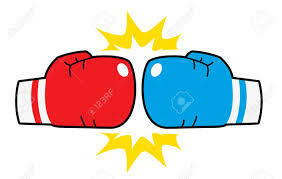 IT and computing mirror real life in a lot of ways, not least the polarisation of ideas into black & white, right & wrong, and even red & blue…for example Labour/Tory (UK) and strangely Republican/Democrat (US) with the colours reversed. Go figure! But is conflict a good thing? I’ll return to the IT thing later, but first a little bit about the brain! 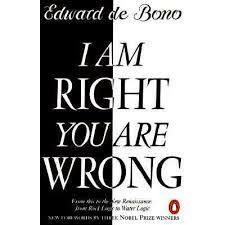 The excellent Edward de Bono wrote in ‘I am right, you are wrong’ about the tendency for humans to develop sometimes irrational and rigid black and white thinking. Despite what you may have heard the brain is not like a very advanced computer, it does not contain a neatly organized set of on/off binary switches. De Bono provides a great analogy comparing each brain cell (neuron) to a many-tentacled octopus on a beach…work with me here! The tentacles of one octopus are attached to many others and provide a pattern of ideas, associations and information (external stimuli are stored and recalled as memories). So far so good, but as each connection is ‘fired’ – remembered, added to, reconnected – it becomes both more sensitive and fixed such that our thinking and perspective on the world becomes less flexible. Cue another de Bono analogy about a sand table; you probably need to read the book. Any new information is compared with what we know or believe already, which tends to strengthen existing ideas and dichotomies, such as rich/poor, good/bad, like/dislike, Liverpool/Everton! Creative thinking (and de Bono’s Lateral Thinking) attempt to trick the brain into building new connections and insights by thinking outside the box. Back to IT; I have written about process-orientation and User stories/Use Cases, techniques that can offer different perspectives to better understand and document behavior and define the needs of an IT system. Both techniques have their advocates, but they don’t exclude each other, there is no right or wrong way of doing things (in this case). I have also weighed in with my view on the Agile vs. Waterfall debate – again calling for compromise and co-existence. This is only the tip of the iceberg, almost every product, idea, requirement, design feature, and way-of-working will attract believers and sceptics…with both good and bad consequences. The existence of jargon and a ‘tribal’ mentality throughout the IT industry, and elsewhere in related professions and functional areas, may not always be a force for good. • Commitment to a cause or community can be a good thing, focusing energy and team spirit. • It is often good practice (and has proven evolutionary value), that pitting a ‘champion’ against a ‘challenger(s)’ where both can’t co-exist can help to kill-off the weakest or possibly create a more successful hybrid. • If the outcome is believed to be either absolute victory or absolute defeat (so-called ‘zero sum’), then the polarization increases, and a sense of perspective and logic can be lost. The cost in effort, resources expended and lost opportunities can far outweigh the possible benefits. It can be difficult when someone is negative about something you have worked hard on but the key is not to take it personally and not to see it as negative, but as feedback that will help you improve. True, both a ‘pro’ and ‘con’ – being passionate and committed to something and not taking criticism (or defeat) too personally. let me know when you solve that particular conundrum! Thank you for commenting.